On Sunday April 19 we will join members of the Lucille Larson family in dedicating the newly remodeled youth education center. This occasion has made me think again about the purpose of having such a space. What do we hope to accomplish in all of our spaces of learning and fellowship? The children were gathered at a table. A candle was lit as the room lights were turned off. Sara then taught them a scripture verse about light overcoming the darkness. Then they sang their welcome song which involved some table tapping: “Hello to everybody, it’s great to see you…” And then each child and teacher was named: “Hello to Arii, it’s great to see you,” and then “Hello to Sandy, it’s great to see you,” and so on..
Next the children moved to their story table. 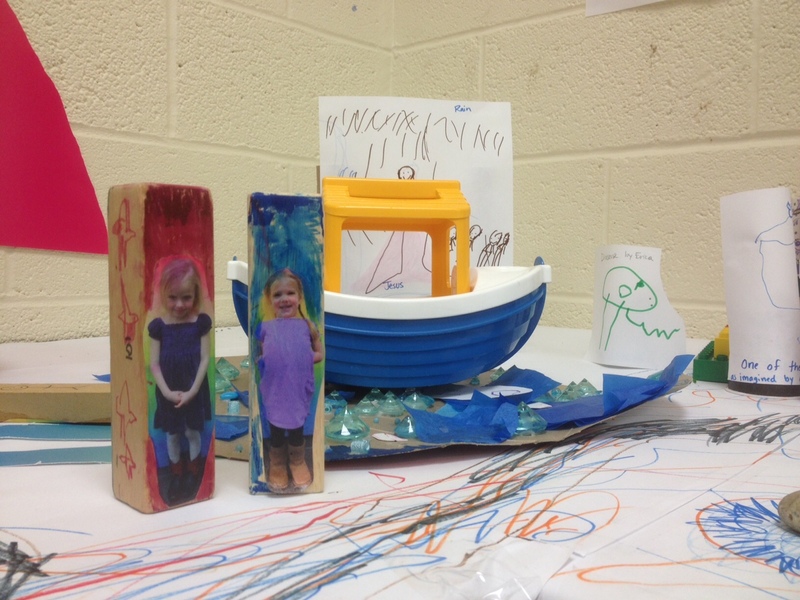 Sara and the children add characters and unique objects to this table each week. 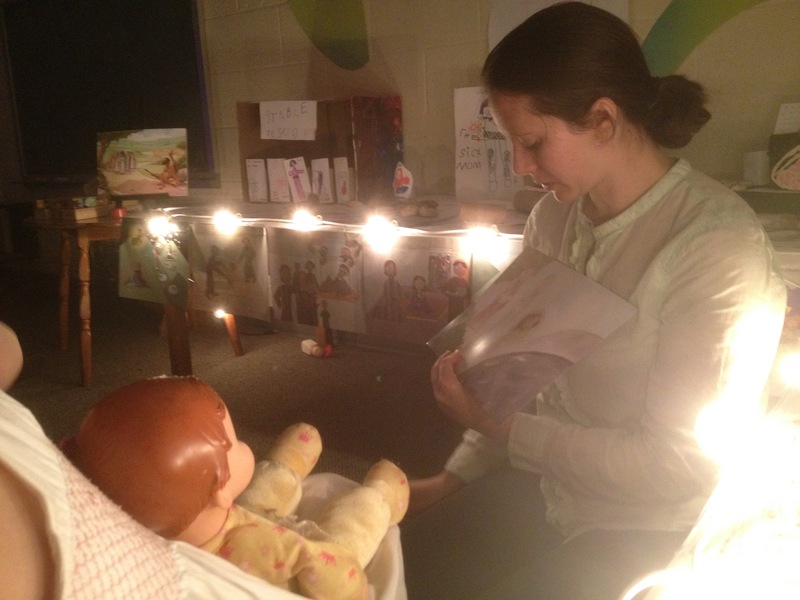 With the lights still dim, Sara reviewed the stories from previous weeks. She did this by walking a paper-cut Jesus through the/his story. The children listened intently, as did the dolls. 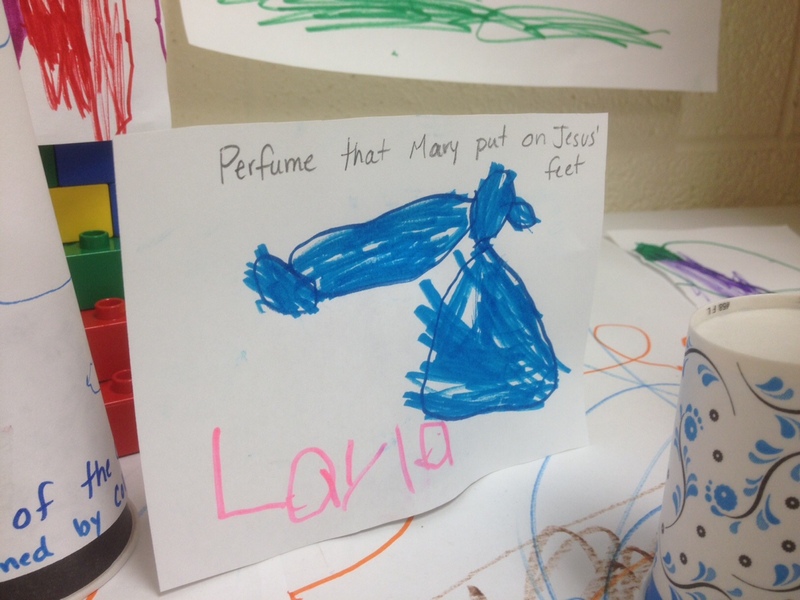 A favorite moment on Sunday was when Sara told them the story of Mary anointing Jesus’ feet with costly perfume. Sara took out a jar of perfume and let them each smell it. Out went their feet as she knelt down and dabbed a little perfume on their socks/toes. Arri of course wondered if his feet smelled good. The story about Jesus’ death on the cross inspired a lengthy conversation about guns and the importance of telling an adult if they ever see someone with a gun. 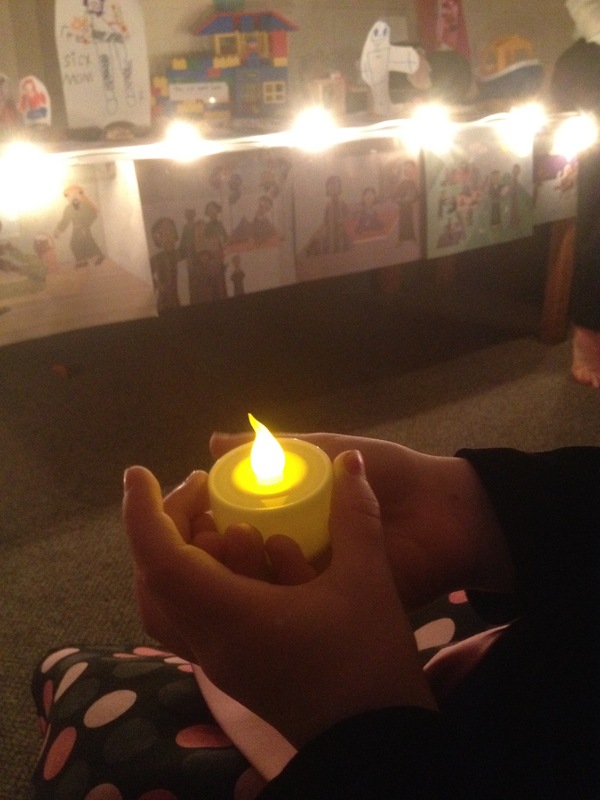 As is the case every week, Sara then asked the children where they would like to go in Jesus’ story? Many of them went to the sea because they like the “magic” and “powerful” Jesus who walks on water. Notice the blocks below with pictures of the children on them. 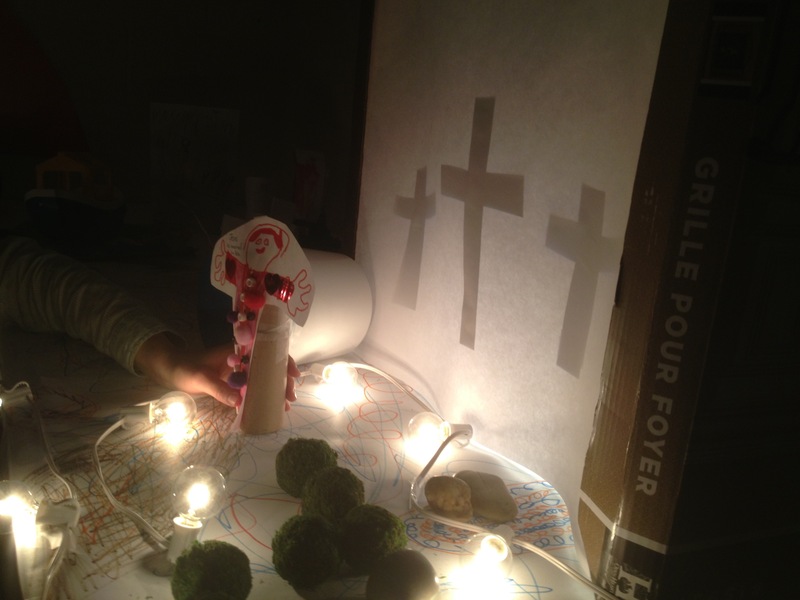 The children then engaged in creative play involving finding and playing with light. I didn’t stay for the end, but as I walked out I heard Sara invite the children to bring their own lights from home in the coming weeks. Deep gladness is what I felt as I watched, listened, and wondered who these little ones will continue to become, and how they will choose to carry the Jesus story/movement forward.